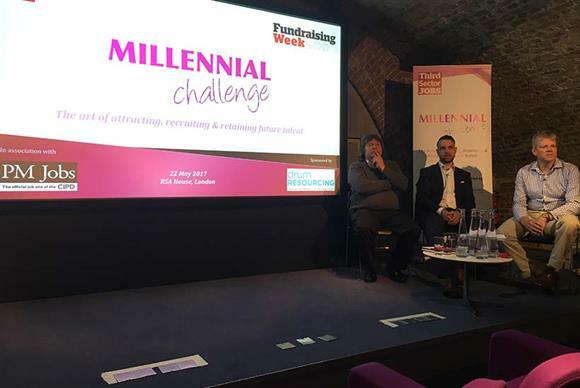 As part of Fundraising Week, Third Sector Jobs, in association with People Management Jobs and Drum Resourcing, hosted The Millennial Challenge - an exclusive event for HR professionals and hiring managers - to address their challenges around hiring and retaining millennials. More than 20 delegates attended the event on 22 May, which took place at RSA House, London, with representation from top charities including Anthony Nolan, British Heart Foundation, Prostate Cancer UK and Battersea Dogs & Cats Home. Key speakers included Armen Lloyd, owner at Drum Resourcing, Paul Nott, principal consultant at NFP Consulting, and Peter Reeve, head of HR at the Motor Neurone Disease Association & chair of the Charity HR Network. "We’re not getting any younger"
Peter Reeve set the tone of the session with his introductory statement:"We’re not getting any younger" - prompting delegates to acknowledge the need to attract the next generation of fundraising professionals. Having originally been reluctant to move into the third sector himself, perceiving it as somewhere people with good careers "go to die", Reeve soon realised it was a fantastic career choice as well as a chance to make a difference. He was however put off by the lengthy application form and believes there is still much work to be done to attract young people to charities. The rest of the session explored a range of possible ways to address this challenge. Armen Lloyd introduced ‘the science of candidate attraction’, which essentially involves exploring the multiple digital routes to attracting the right fundraising talent, from behavioural targeting to programmatic advertising. In order to reach a wider candidate pool, Lloyd urged HR professionals to utilise a range of tools including CV databases, programmatic targeting, social media and fixed fee sourcing. In addition, Drum Resourcing has recently created a recruitment tool called a ‘career advertising network post’ that uses behavioural targeting software to put relevant jobs in front of people as they’re surfing the web - whether they be on YouTube, a holiday site or any other website. Lloyd went on to emphasise the importance of using the latest digital technology to get your jobs in front of the non job-seeking audience, as these are more likely to be the high quality professionals you want to attract. He also encouraged delegates to use the services of a recruitment advertising agency who can negotiate the best rates to get your job advertisement in front of millennials. In order to get your message to top talent, Lloyd advises using a variety of content formats, with video followed by still pictures being the most effective. "Share positive images about your charity on social media and on your career site", said Lloyd. "You can create simple low cost videos on an iPhone showing what your workplace looks like, and it needn’t be too polished - in fact, the less professional it looks, the more genuine it comes across", he added. An attractive sector in which to work? Paul Nott led the next part of the event challenging how attractive the sector is for millennials - the young people who will be leading the next generation of fundraisers. Nott advocated a new approach to presenting your job specifications. "It’s often the fear of the unknown that puts people off applying for a job, especially if they’re happy in their current role", he commented. Rather than merely stating the job title, salary and a long list of generic responsibilities, Nott suggested bringing your organisation to life with some narrative about the charity and the difference it makes, pictures of the team, a video of the office, specific projects the role relates to and only truly essential criteria. Nott added: "Don’t use application forms - many don’t have the time or inclination to fill these out and you could lose out on valuable talent if you make these mandatory". "The offer letter is where things can go horribly wrong", warns Nott. "It’s often a different story to the interview". He referred to an example of a bad offer letter which typically arrives days or weeks after the interview and in many cases is much colder in tone than the interview as the purpose is often to get all the facts and terms and conditions in. "This is a vital time to ensure you engage them, not put them off", asserts Nott. He recommends taking a friendlier approach, including details to make them feel welcome, such as who their buddy will be on day one and a proof copy of their business card so they can visualise themselves in the role. "These will make them less frightened to resign from their current role", he added. Once your new recruits have joined, that doesn’t mean it’s time to stop making a good impression. Their first day is one of the most crucial if you want them to return the next day. Ahead of their first day, little things like telling them who will lead their induction, whether they will have a desk and who else knows they’re coming, will help make them feel welcome. With Brexit looming, it will be even more important to work smarter to attract new talent who might otherwise be tempted to stay put due to the uncertainty that lies ahead. At the same time, your best staff could still be poached by your competitors so you need to carefully consider what you will do to keep them.